Thanksgiving is on the horizon so today I did a little prep for it. I baked up and then pureed the two pie pumpkins that have been waiting on the counter for just this holiday. My plan is to bake a pumpkin pie (natch) as well as a pumpkin cheesecake. The pie will be light and delicate. I like it like that, different than the denser pumpkin pies I admit to also readily enjoying. The cheesecake will be heavier, a thick creamy cylinder of deliciousness. 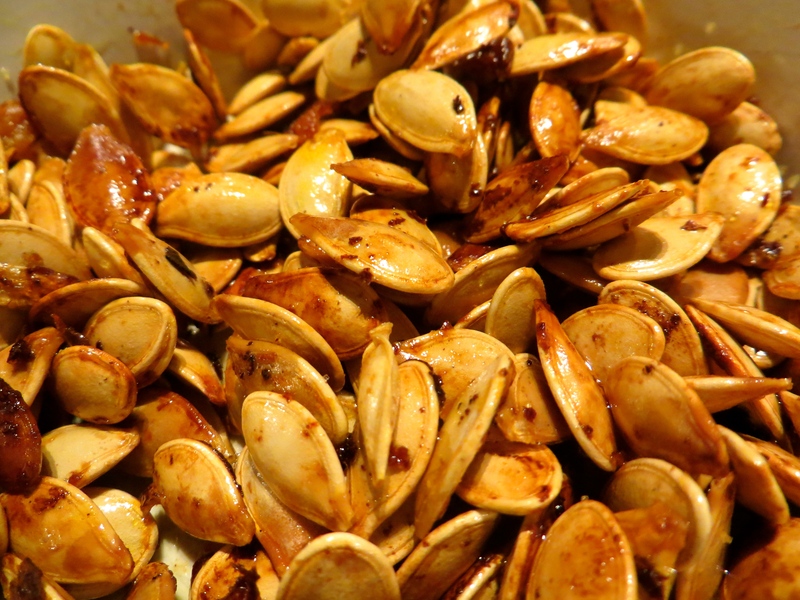 Once the pumpkins were out of the oven and cooled and pureed, I tossed the pumpkin seeds with a little oil and a little salt and roasted them up in the hot oven for a pre-dinner snack. They made a fine pre-dinner snack. While I turned those seeds in the oven, and while I whipped up dinner itself, I sipped my latest beer–a pumpkin ale, light on the spice. I like a decent pumpkin ale but most of the ones I have tried are pumpkin spice ales, heavy on the cinnamon, cloves and nutmeg and hardly tasting of pumpkin. I created this beer to have an ale worthy of the squash moniker. It has a zip to it that makes me say Hmm as well as Mmm. Good stuff. On another note, I finally (finally) planted the dang garlic. The last week has been crazy cold and things have begun to freeze up. Today, however, offered a warm enough window. 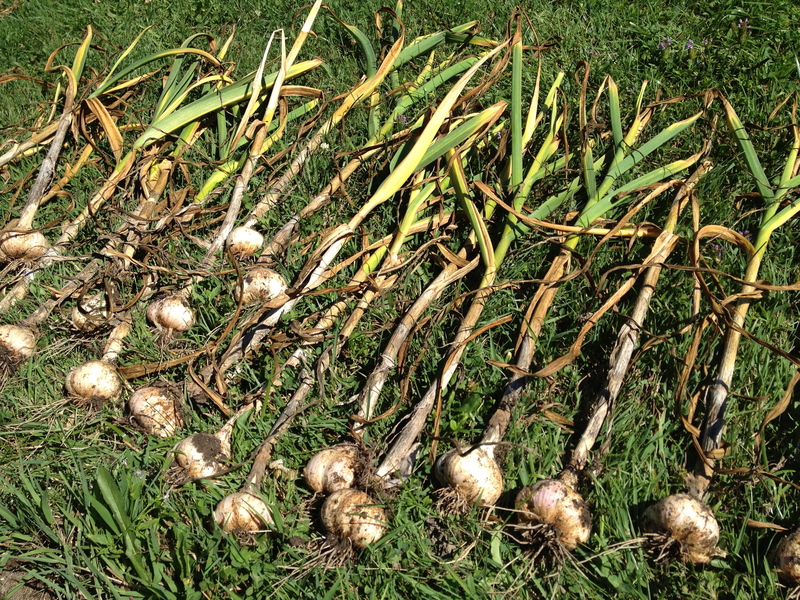 I dug up one garden bed and popped in some bulbs saved from this year’s harvest. Hopefully they will appear as green shoots in the spring. While I will have to wait many months for the garlic, next week I will get to enjoy a pumpkin pie, a pumpkin cheesecake and a fine pumpkin ale, all in one day. In the meantime, there are these toasted pumpkin seeds to polish off. You know, before they get stale. I have started pulling tubers. Let me say that again. I have started digging up root vegetables. I made some roasted potatoes from the first batch and they were so good I made another last night. Carrots are ready now as well. These are some good ones–a variety of colors and flavors. I should have a good volume of food with these crops before all is said and done. The first potatoes I pulled up were German Butterball. These were from tubers I had saved from last summer. I hadn’t meant to save them, exactly. I had stored them to eat and then missed some at the end of the bin. They sat until spring, when they were sprouting like crazy. I had some extra space in the garden and so I popped them into the dirt. I am glad I did. They are a, duh, buttery variety, and white. I also have pulled some others–purple and pink. I love that. Who wants only white potatoes when you can have purple and pink? Several of these colorful plants never took so the extra white potatoes were especially welcome. I have purple carrots as well, along with yellow and the standard orange. Our soil is mostly clay–although I did add a good deal of compost this spring–so sometimes the carrots get stunted. I pulled three is a row that were stubby. One of them looked like some kind of alien landing craft. Maybe my garden, which is a circle rather than your typical rectangle, was an inviting locale for an extraterrestrial vehicle. 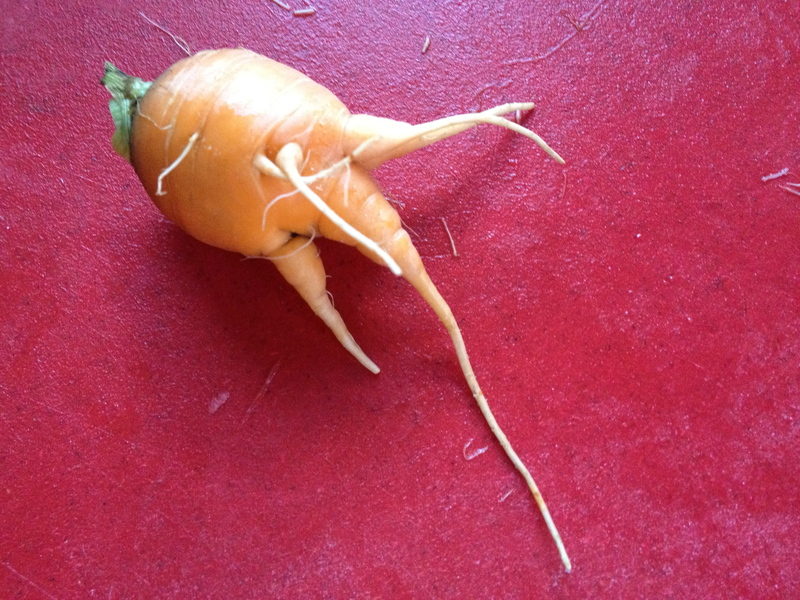 Perhaps my carrots are actually buried spaceships? You be they judge. Odd Shaped Tuber or Visitor from Space? Yesterday I pulled the garlic. I should have pulled it sooner but we were away and it just didn’t happen. I planted two varieties in the fall and one of them was way ready to yank from the dirt. It was so ready that a few of them broke at the stem. 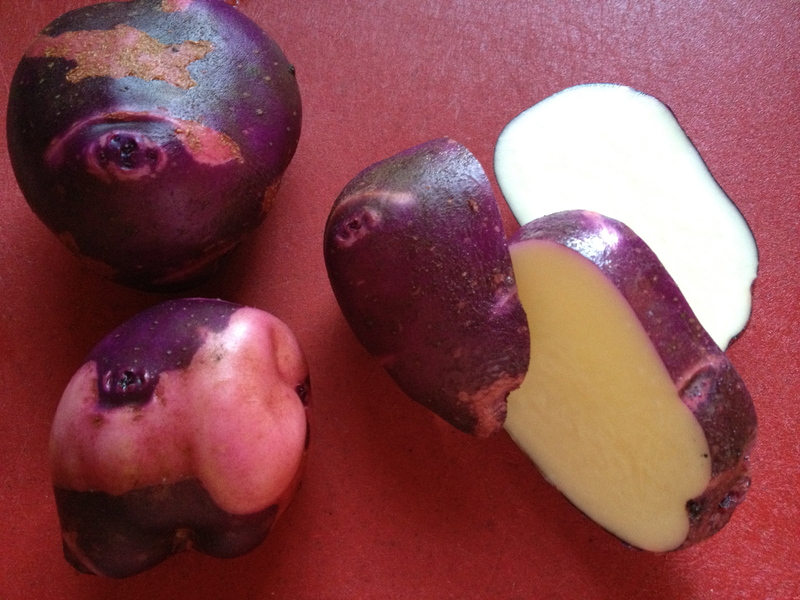 This was the Purple Bogatyr, a purple tinged, smaller variety. The other is much larger and, because I let it go so long, the bulbs are huge. I have 25 bulbs drying in the sun right now and I pulled a couple earlier as well. For the first time a couple died in the spring–not sure why. 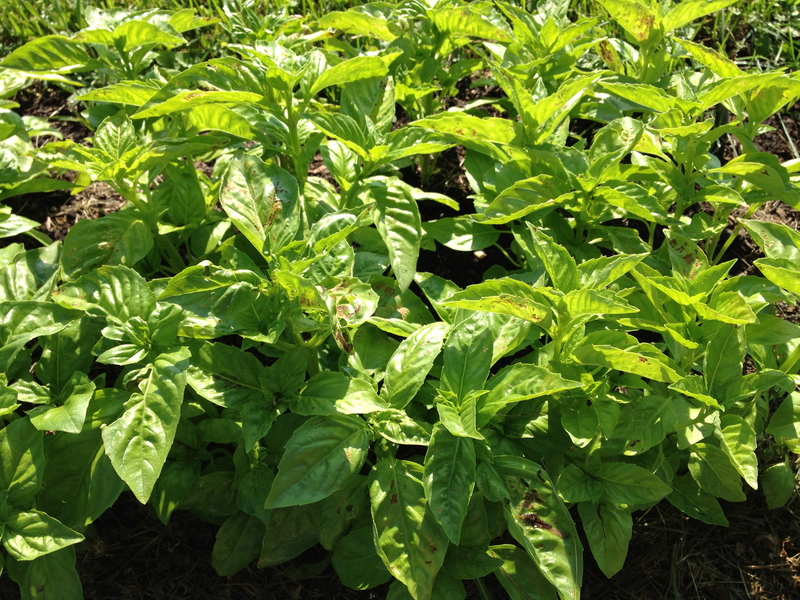 I plan to crank out some pesto in the next couple of days, along with some pico de gallo. Hopefully this garlic will last a while–not all year I am sure but a perhaps through the fall. We do eat a lot of garlic. Next up: onions. They are looking good and the tops are starting to fall over. Pretty soon I will pull them as well. 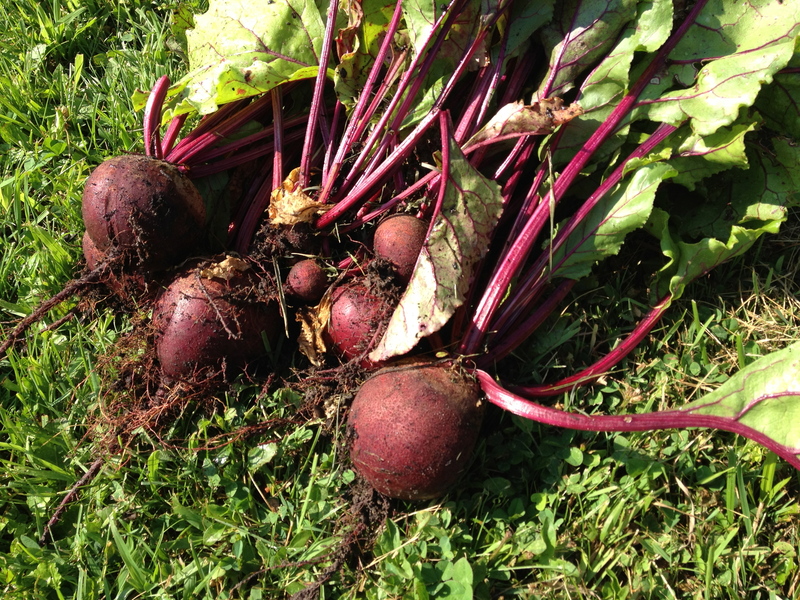 Yesterday I managed to plant some lettuce, arugula and beets. Due to our Mother’s Day activities I had to get to the garden beds late in the day. I ran out of time to plant carrots. The garlic is going gangbusters and the spinach is leafing out nicely. 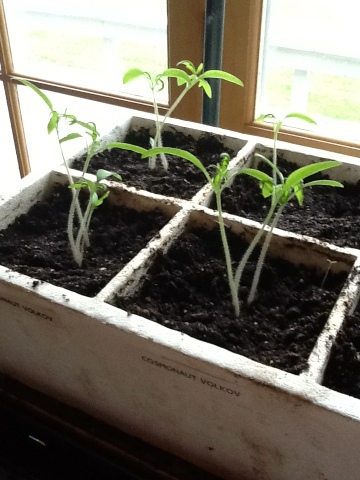 Inside, tomatoes and peppers and basil are reaching for the sun in the windows. Onions and leeks are ready to get outside. Things are growing nicely. I am a little behind since I want to spread some beneficial nematodes. My official workplace is right near a garden supply store where I can order some of these handy microscopic critters, but since I usually work out of my home, I have not had the chance to get there in far too long. Before I plant cucumbers and pumpkins and melons I would prefer to work on reducing the cucumber beetle situation. I am not fond of those attractive little pests. They do a number on the fruiters. This year I have planted a good number of flowers, however. Sunflowers and bulbs and annuals. I don’t usually get to those so I can say I am proud of myself for that. Every year I have the ambition to keep up with all the amazing landscaping that came with the house. That has not happened. Maybe this year. But don’t hold your breath. Of course, I would not recommend holding your breath for much, except maybe the paper mill in Rumford, Maine, so maybe that advice isn’t worth much. I hope this week to make more progress on the nematodes and then the rest of the crops. And the garden will grow.